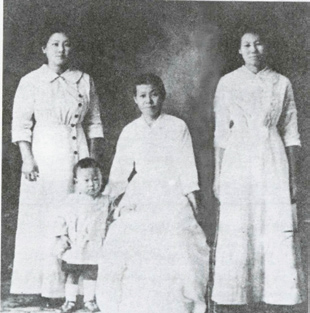 Park, Won-shin Kang: She collected independence funds through Korean Women’s Patriotic League. She is a sister-in-law of Sarah Kang. She came to Hawaii in 1905. She worked at vineyard for 15 cents an hour while she was supporting her husband studying law to be a lawyer, yet the dream of becoming a lawyer could not be materialized due to racial discrimination back then. She then moved to Dinuba, California to join Sarah Kang to establish a Korean Women’s Patriotic League with Sarah Kang. She made efforts to collect in- dependence funds to send them to the Provisional Government in Shanghai. She actively led a Japanese soy sauce boycott campaign there. She moved to Los Angeles. Her husband became the first Oriental Medicine Doctor in Hollywood area. She was survived by three children: Gene, James and Ester. She died in 1977.2.26 and is buried at the Hollywood Forest Lawn in Los Angeles, California. In 1995, the South Korean government posthumously recognized her with the Order of Merit of National Foundation / Patriotic People Award for her unwavering sacrificial contribution to the Korean independence movement throughout her entire life.